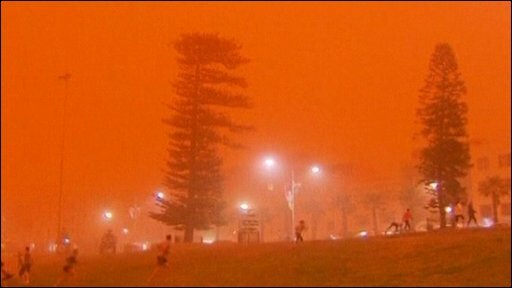 A large stretch of Australia's east coast, including the largest city Sydney, has been shrouded in red dust blown in from the desert outback. Visibility in Sydney was so bad that flights were diverted and harbour ferry traffic disrupted. Landmarks such as the Opera House were obscured, and many residents took to wearing masks. Emergency services reported a surge in calls from people with breathing problems. Dust from arid central Australia is swept across New South Wales. Dust storms are common in the arid "red centre" of Australia, but they rarely reach the populated coastal regions. The storm crippled the transportation system, with long delays to flights and bumper-to-bumper traffic on major roads. Children, the elderly and people with respiratory problems were told to stay indoors until the dust had cleared later on Wednesday. It was blown out to sea and up the coast by the strong winds. On Wednesday morning, the dust storm stretched hundreds of kilometres along the coast of Australia, a scientist with the New South Wales (NSW) government told the Sydney Morning Herald newspaper. Officials said air pollution levels from the dust were the highest recorded since records began in the 1970s, with 15,500 micrograms of particles per cubic metre. "On a clear day the readings for particulate matter or PM10 is around 10-20 micrograms per cubic metre," said Chris Eiser of the NSW department of the environment. "During a bushfire, when there is heavy smoke around, we might see readings of around 300 to 500 micrograms per cubic metre." Other experts described the dust storm as the worst in Australia since the 1940s. Sydney resident Andrew Hawkins said "it was like waking up to see that Armageddon is upon us. The sky was bathed in a red hue, and I must say that the thought did cross my mind that either my eyes were playing up on me, that something catastrophic had occurred... or that it was something meteorological," he told the BBC. This vast, dry island is well used to nature's volatility, the character of its people forged by exposure to forest fires, droughts and floods. The epic dust storm that engulfed the country's biggest city and other heavily populated areas is a reminder of the potency of such indomitable forces. Few Sydneysiders will ever have experienced an early morning glow so eerie or threatening, and many may have thought the ghastly red sky and a cloudy, suffocating haze were signs that their harbourside home was again menaced by bushfires. Those days will surely come but for now in Sydney there is relief. Within hours, the fog of grit and dirt was gone, blown up the coast by strong winds. Tanya Ferguson described the dust storm as the weirdest thing she has ever seen in her life. "It was like being on Mars," she told the BBC, "I haven't been there, obviously, but I imagine that's what the sky would look like." The Australian Bureau of Meteorology warned of "widespread damaging winds" in Sydney and other areas, as gusts of 65km/h (40mph) hit the city. International flights to Sydney were diverted to other cities and there were long delays at the airport throughout Wednesday. Doctors warned that children, the elderly, pregnant women and people with heart and lung diseases were particularly at risk and should stay indoors or take precautions to avoid the dust. "Dust storms are particularly hazardous for anyone with chronic lung disease or sinus disease. Once the particles per cubic metre are above 300, dust storms pose a risk to lung health," said Dr Phillip Thompson of the University of Western Australia. The dust cloud in Brisbane, about 730km (450 miles) north of Sydney, was also reported to be thinning on Wednesday afternoon, but forecasters warned that further storms are likely over the coming days. The BBC's Phil Mercer in Sydney says it has been a difficult 24 hours for Australia, which has been hit by earthquakes, hail storms and bushfires. In parts of New South Wales, huge hailstones whipped up by thunderstorms smashed windows and sent residents running for cover. Further north in Queensland, officials banned open fires in many areas when bushfires sprang up after a spell of hot, dry weather. Two minor earthquakes hit Victoria state on Tuesday, and heavy rains that followed led officials to issue a warning of flash floods.